For die-hard fans of Cincinnati's most famous dish, seeing the headline "Is Cincinnati chili actually chili?" on a story by the Chicago Tribune probably induced a few groans. Here we go, again. Another know-it-all outsider bashing our beloved dish for kicks. Enough with these articles. I'm one of those people who has read a lot of screeds by self-appointed culinary experts mocking our unique regional dish. Heck, I'm personally still offended by Deadspin writer Albert Burneko's 2013 article "The Great American Menu: Foods of the States, Ranked and Mapped." Burneko ranked Cincinnati chili dead last at No. 52 on his list, describing it using phrases such as "the worst regional foodstuff in America" and "horrifying diarrhea sludge." Perhaps the bad taste from reviews like the one above is exactly why Chicago Tribune writer Nick Kindelsperger's article "Is Cincinnati chili actually chili? A deep dive into the city's most famous dish" pleasantly surprised me once I made it past the headline. "If this all sounds like the beginning of an epic slam against a beloved regional Midwest dish, the kind we've been exploring all month, set down your freshly sharpened pitchforks. I've been a fan since my first bite in college," Kindelsperger wrote. He goes on to admit his mother shipped cans of Cincinnati chili to him when he lived in London for six months. Kindelsperger then dives into the rich history behind Cincinnati chili's origins and its rise in popularity. 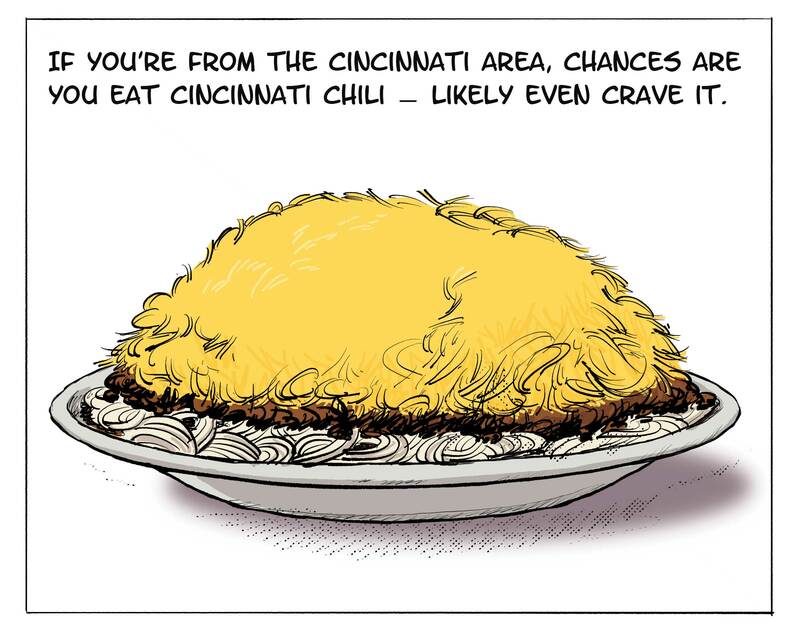 The history is the same one that WCPO cartoonist Kevin Necessary illustrated in his 2017 story "Chili is a Cincinnati staple, and we have these guys to thank for it." Like Necessary, Kindelsperger draws upon local historian Dann Woellert's book "The Authentic History of Cincinnati Chili" in his article. Kindelsperger asserts, "Cincinnati chili could only have come from this country, and not just because it has a major Midwest city in the title. Only a true melting pot could have provided the foundation for a dish developed by Macedonian brothers that is served atop an Italian style of noodle and, initially at least, was sold to mostly German immigrants." He ultimately recommends people visit Dixie Chili, Camp Washington Chili and Price Hill Chili, and he explains each parlor's historical significance to the neighborhoods where they are located. It seems as if Kindelsperger understands that beyond Cincinnati chili's unconventional appearance -- and the thread-bare debate over whether or not it is actually "chili" -- for nearly 100 years a rich history that has bred a loving familiarity has slowly simmered its way into each bit of Cincinnati chili.